1. Tags or labels – electronic sensors that are attached to clothing & merchandise. 2. 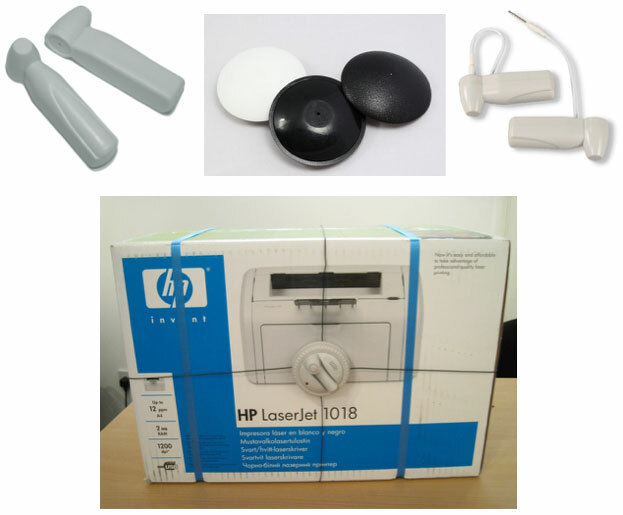 Detachers & deactivators – used to remove or deactivate the tags or labels. 3. Systems that detect the presence of tags at store exits. When the item is purchased the tag is either removed or deactivated. Tags are typically removed from clothing (by using a detacher at the checkout or counter), whilst merchandise with the tag/label incorporated into packaging are usually passed over a pad that deactivates the tag/label. An active hard tag or label that is carried into the detection zone of the EAS system usually at the store exits will set off the alarm. How do the EAS systems work? All EAS systems work using the same principles regardless of the manufacturer, design or technology. In simple terms, the following description lays down a fundamental explanation of how the technology works. A transmitter antenna sends out a magnetic or radio frequency signal at a defined frequency to a receiver antenna. Between the transmitter & receiver, the system creates a detection zone or field from the frequency signal. Upon entering the detection zone/field an EAS tag or label will create a ‘disturbance’ that is detected by the receiver antenna. The ‘disturbance’ within the tag/label is unique to the transmitter and receiver system in place and is the key element in detecting a possible theft as the distinctive alarm is unlikely to be caused by natural causes. EAS systems range from very low magnetic frequencies through to the radio frequency range. These different frequency types play a key role in establishing the exact features that affect a systems operation. What EAS systems are available? • Radio Frequency (RF) swept system. How do the main two systems work? 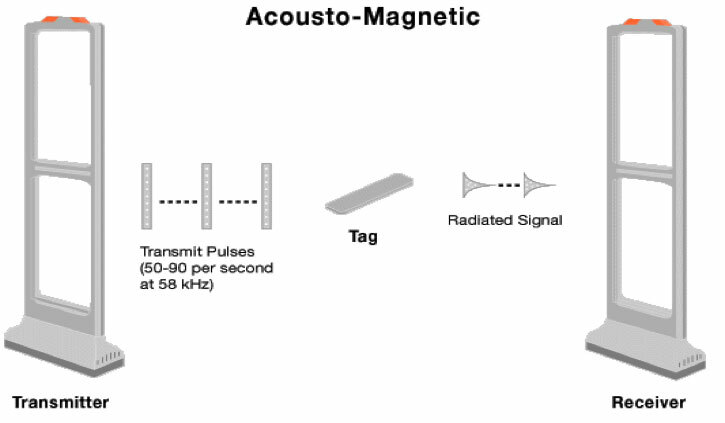 Acoustic-Magnetic EAS systems transmit a magnetic frequency signal at a frequency of 58KHz in a pulsed pattern. The transmitted signal is then used to energize an acoustic-magnetic tag or label that is within the systems detection zone or field. Whilst the transmitted signal is switched off between pulses, a narrow band receiver circuit within the electronics pack of the system then detects the tag or label signal. • That it is radiated at the right frequency and has defined characteristics. • That it occurs at a precise point in time, which is also synchronised to the transmitter. • That it has been received at the proper level, and at the correct repetition or pulse rate. If all the above criteria are then found to have been met for several times in a row, only then will an alarm occur. This unique tag or label signature and also the large tag signal produced by the AM technology EAS system, enables it to achieve a wide surveillance area coverage, high tag or label detection rates, and also provides immunity to false alarm situations. The newer acousto-magnetic system, which has the ability to protect wide exits and allows for high-speed label application uses a transmitter to create a surveillance area where tags and labels are detected. The transmitter sends a radio frequency signal (of about 58KHz) in pulses, which energize a tag in the surveillance zone. When the pulse ends, the tag responds, emitting a single frequency signal like a tuning fork. While the transmitter is off between pulses, the tag signal is detected by a receiver. A microcomputer checks the tag signal detected by the receiver to ensure it is at the right frequency, is time-synchronized to the transmitter, at the proper level and at the correct repetition rate. If all these criteria are met, the alarm occurs. 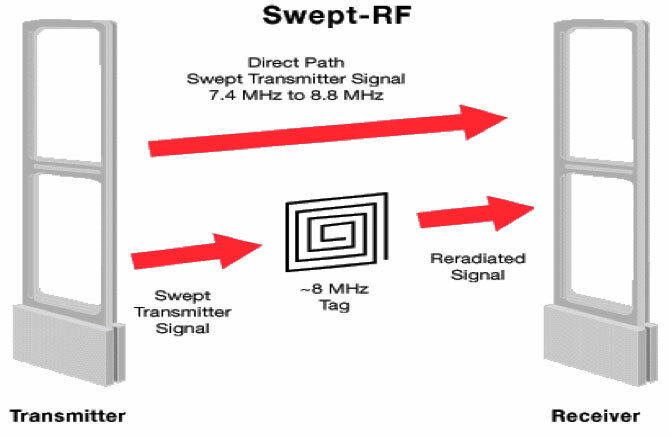 A Swept-RF EAS system uses a transmitter antenna to create a detection zone or field where tags can then be detected. The systems transmitter antenna sends out a signal that varies between 7.4 and 8.8MHz (millions of cycles per second), which is why it is referred to as swept; this is because it sweeps over a set range of frequencies. The transmitter signal then energises the swept-RF tag or label that may come within its detection zone. The tag or label is composed of a small electrical circuit containing a capacitor and a coil, both of which are able to store electrical energy. When these elements are connected together in a loop, the components have the ability to pass energy back the forth or resonate. The tag or label responds by emitting back a signal that is then detected by a wideband receiver (a receiver wahich looks for signals across a wide frequency range), which is contained within the electronics pack of the EAS system. For most swept-RF systems the broad width that is typically about 1,400,000 Hz. By detecting any phase differences between these two signals, the receiver is then able to recognise the presence of a tag or ‘live’ label, and if one is detected it alarms. What other components and devices are associated with EAS systems? 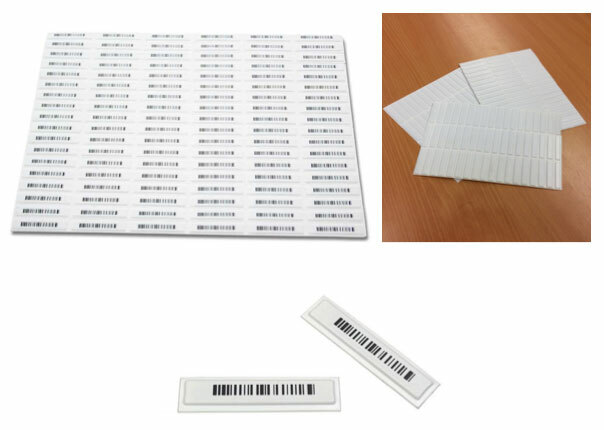 Disposable labels: Disposable paper labels are available in many different types — pressure-sensitive labels with simulated bar codes, tags or labels that can be imprinted with price, inventory, promotional or bar-code information, and tags specially designed for products and merchandise, which can easily be pocketed by shoplifters. These thin, adhesive-backed labels can be as small as a paper clip and can be easily disguised to look like standard retail tags. Most importantly, the radio frequency tags, unlike tags connected to some electromagnetic sensors can’t be disrupted by common magnets. Benefit denial tags: This is a fluid tag. If you steal an item with this kind of tag, you’re going to get an unpleasant surprise when you try to remove it in the dressing room or later at home. The ingenious tags have been designed to break and release fluid — usually colored indelible inks — onto the garment (working even against gravity) and on you if you try to forcibly remove it. The idea is that a shoplifter is being denied any benefit from his/her crime and will not be able to use or sell the item because it has now been ruined. Deactivators and detachers: Desirable qualities in deactivators include a large deactivation zone and 100 percent deactivation with no false alarms. The type of electronic deactivator depends upon the kind of EAS system and tags used by the store. We’re all familiar with hand-held scanners and flat scanner pads used to swipe and deactivate merchandise tags. Traditionally, scanners must touch a label directly to use specific frequency to deactivate it. But with the growing use of source tagging (hiding identification tags somewhere on an item or in its packaging) proximity deactivators, or verifiers that don’t require contact with a label, are becoming more important. To remove most hard tags, a detagger/detacher/releaser is necessary. Today’s detachers, which basically unlock the tags, are designed so that they cannot be copied or purchased by shoplifters. Some detachers are hand-held; others are fixed — most are simple devices with no moving parts, something that makes them very durable.